Kings Cross Station is a 10 minute walk from Garvan. Exit the station onto Darlinghurst Rd and turn right. Walk along the road, cross over William Street and continue walking up Victoria St.
Garvan is located on the left hand side of the street, just after the Green Park Hotel and The Kinghorn Cancer Centre, on the corner of Victoria and Burton Streets. You can plan your train journey using the Transport NSW website. Bus routes 389 and 311 stop on Burton Street. Buses 378, 380 and 382 stop nearby on Oxford Street. For route maps and timetables see the Transport NSW website. Garvan is located on Victoria St, which connects two major roads, William St and Oxford St. The street address is 384 Victoria St, Darlinghurst 2010. Limited metered parking is available along Victoria St and the surrounding streets. Parking is also available at St Vincent’s Public Hospital and St Vincent’s Clinic. 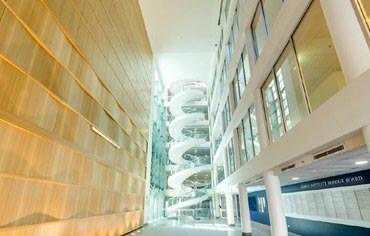 Garvan is located adjacent to St Vincent's Hospital, on the corner of Victoria and Burton Streets in Darlinghurst, approximately 2 kms from the Sydney CBD. See the Sydney City Bike Map (PDF, 3.7Mb) for information about cycle routes to Garvan. Additional information about cycling in Sydney can be found on the Sydney Cycle Ways website.